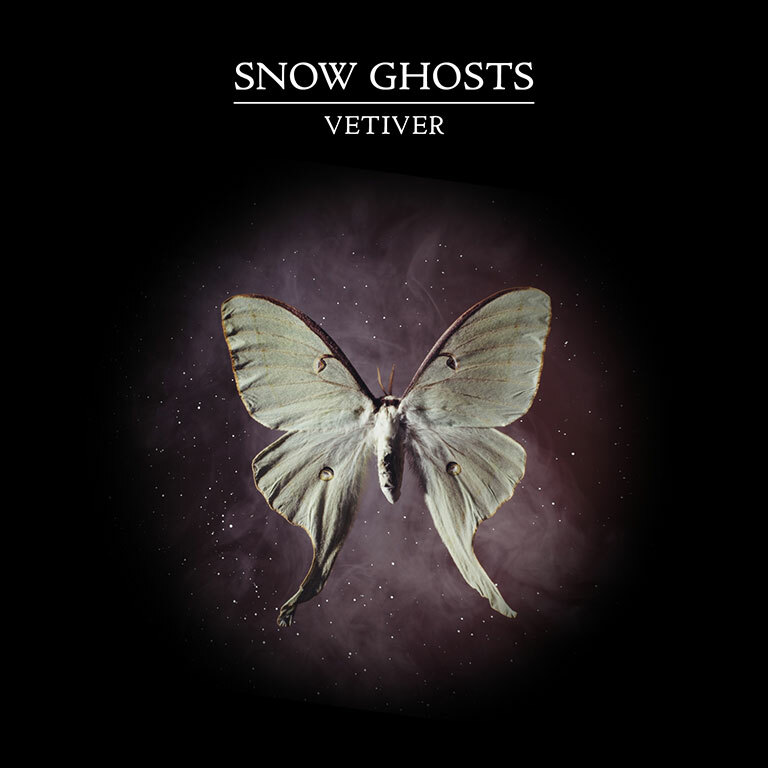 The process for making the video for Snow Ghosts Vetiver was similar to the previous single Lied. 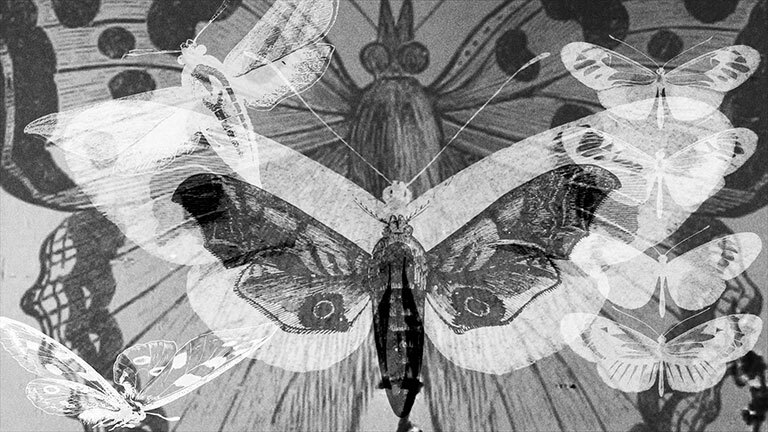 The band had a pre-existing concept for their sleeve design which in this instance was moths, a theme which is brought out in the lyrics. On this occasion I was doing the video in advance of the sleeve design so didn’t have a fixed final image to base things on. But they showed me some references and ultimately they matched pretty well with the finished cover. Again the approach was to find as much interesting vintage film archive as possible and build something from there. Additionally I needed to think up and create something myself that could be interwoven with the archive and also tie into the visual theme. With the video for Lied I had taken inspiration from the fog and mist on the cover to pursue the whole cloud tank approach, but now as I was working in advance of the cover artwork I was a bit stuck. For a short while I even considered getting some moth eggs and an incubator off the internet so I could hand rear my own troupe of performing moths. But the hatching cycle was longer than the time I had until the video deadline, so I abandoned that idea thankfully. 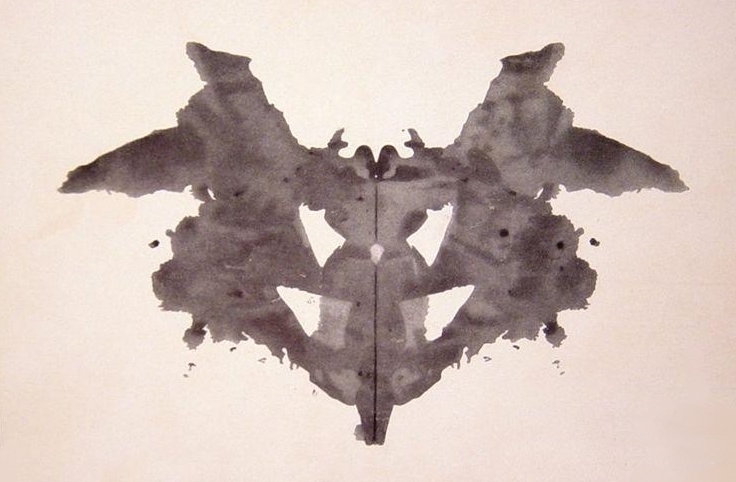 Eventually, and I don’t remember why, I started to think of those Rorschach ink blot psychological tests and when I went googling I found that one of the very first original Rorschach tests from 1921 looked just like a moth. So I thought if I could film some ink landing on the paper in ultra-close-up, and also “live” draw some Rorschach caterpillars and moths freehand then it would look pretty cool altogether. Just like with the cloud tank idea for Lied I researched some established filming methods, got the gist then knocked up a ramshackle version in the back bedroom. My basic setup was a Canon 60D with a 50mm lens pointing straight up at the ceiling, then suspended above it using a clamp was a sheet of perspex taken from a cheap Ikea picture frame. Then you get some large coffee filter papers and one at a time dip them in water and lay it on top of the perspex. 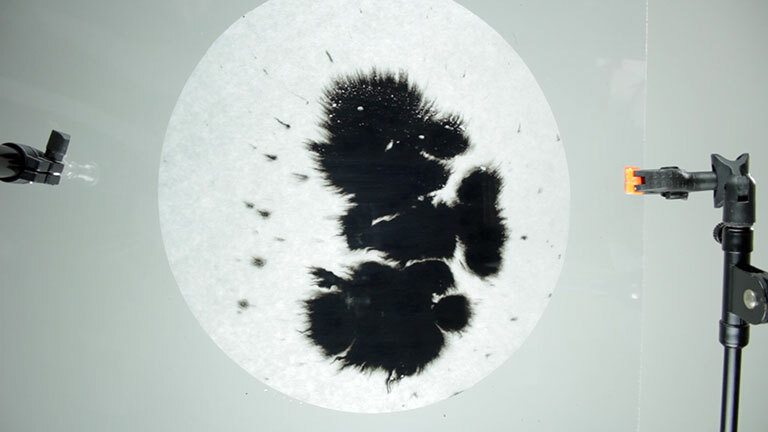 The ink I used was a little dropper bottle of India Ink, and when you drop it on the wet filter paper the water exaggerates the spread rate. To avoid reflections on the perspex I lit it from above and to the sides using two lights in combination. I experimented with different lighting angles but it didn’t make a great difference to the results to be frank. Some of the shots I filmed in macro from only a few inches below the perspex, and some I would place the camera much lower to film the whole paper. 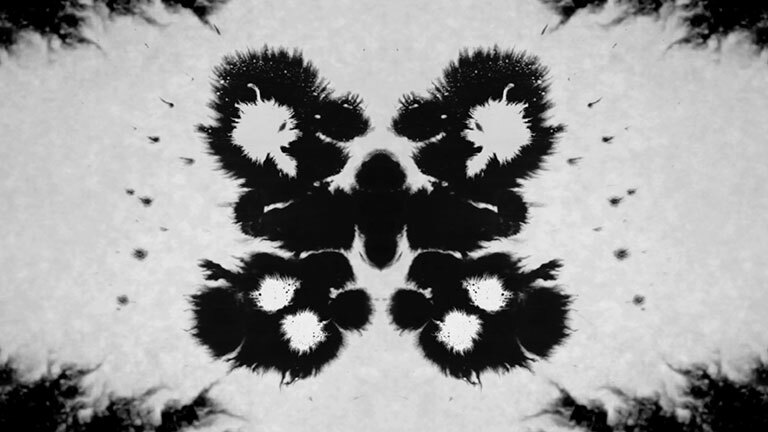 Knowing that the Rorschach effect would be achieved in post by placing a mirror effect on a central axis, I just had to draw the shape of half a moth to a reasonable standard. Here’s a quick time-lapse of me doing one of them and the corresponding shot in the final video. To complete the final look in post I added some extra ink to the corners to make a frame, and composited some smaller blots inverted to white to make the markings on the wings. As well as archive film I also found the British Library’s catalogue of over 1,000,000 images from 16th, 17th, and 18th century sources that they released into the public domain. In this collection I found some excellent pen and ink drawings of butterflies and moths from Victorian encyclopaedias and the like. Although the drawings have a great aesthetic I only ended up using them for about four seconds of screen time. All of the archive sources are public domain on a Creative Commons license for which I am mostly obliged to give attribution, so here goes. The Turning of the Worm, Insects Astray, Insects on Flowers, Insect Zoo, Caterpillar Eating Red Cabbage, Inch Worm Feasting, Osmia lignaria larva to cocoon, Mexican Jumping bean moth larva under Foldscope, Zoom into a blue morpho butterfly wing, Honeybee Mouth Parts, Butterfly, Butterfly Flower 57, Monarch Butterflies in macro, NATURE – Caterpillar, Pink Headed Caterpillar, Monarch Butterfly Emerging from Chrysalis, The Four Seasons, Icarusblauwtje zit the zone, British Library images. The finished video can be seen over on my Music Promos page. Tagged Adobe After Effects, Music Video, Snow Ghosts. Bookmark the permalink. Lucas Roche Film Editor | Powered by Mantra & WordPress.